The Graphite Design Tour AD Hybrid is the second hybrid shaft released in 2015. It follows the YS Reloaded, the YS has long been one of my favorites. The Tour AD HY is the fourth version of the Tour AD hybrids, but it is the first I have reviewed. Like most, my primary focus is driver shafts, then iron shafts. The hybrid in recent years is seen as an extension of the iron set. The early hybrids, were too long and did not gap properly into most golfers bags. Over the last few years the trend has moved toward shorter shafts lengths and a view toward integrating the gapping of the set from the longest irons you can hit well into hybrids. Most sets I build recently contain 2 or more hybrid style heads, both traditional hybrids as well as driving irons. When do you take that step, breaking away from your iron set and blending in a hot faced driving iron or launch enhancing hybrid head? Its a simple answer actually. When you see your gaps collapse its time to get the next longest club built in a way to maintain consistent gapping between clubs. And there are many ways to do that which extend beyond the scope of this reviews. One aspect of getting more club head speed and higher launch is changing to a lighter, higher launching shaft. This is where we enter to world of hybrid shafts. Higher launch is easy, make the tip softer. All to often, especially in stock shafts, this comes with higher tip torque. I have been playing exotic carbon fiber, low tip torque shafts for a very, very long time. The problem in this realm is the gag reflex I get from most golfers when they learn that a great hybrid shaft can be more than what they typically see hybrid clubs sold for. The Graphite Design Tour AD HY is one of those exotics, retailing at $175 uninstalled. Is it worth it? Time after time, when I finish the fitting objective I am working on with a client I hand them my hybrid and ask them to try it. And time after time, the reaction is the same, the OMG moment. Then sticker shock. A properly fit, high quality hybrid shaft is a long term investment. You might change heads as head technology evolves, but that properly fit hybrid shaft stays with you and moves into the next head. In my bag, that pair of hybrid shafts have been with me for going on 8 years. What is special about a great hybrid shaft? Three aspects, high launch propensity, tip stability and weight. I will discuss each of these as it relates to the Graphite Design Tour AD HY measurements shown here. This discussion about Graphite Design Tour AD shafts occurred at the PGA Merchandise show, January, 2015. To see more video like this visit the DevotedGolfer Youtube Channel. This entry was posted in Graphite Design, Hybrid Shafts, Russ Ryden - Fit2Score on June 27, 2015 by Russ. 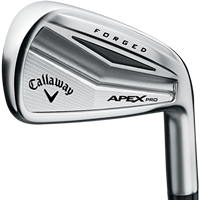 It is noteworthy to mention that the stock graphite in the 2014 Callaway Apex Pro is the UST Recoil. An interesting choice of premium shafts, in a classy players design iron head. Within the golf club fitting and building community there are now three methods to understand bend profiles of shafts. A future technical article will discuss the history and methods of the systems. The 3 point bend system used in these reviews is classical textbook engineering for beam measurement. It is the language spoken by the vast majority of golf shaft designers and engineers. That is why I built the Fit2Score software around this measurement methodology. I tested a review sample installed in a Miura CB-501 on the range and was surprised at how tight my ball flight dispersion was. I had expected more variation from the soft tip. That was not the case, the balls were flying true despite a heavy cross wind the day I was testing. As with any golf shaft, you will not know if it is right for your swing without testing it. This entry was posted in Iron Shafts - Steel, KBS, Russ Ryden - Fit2Score on June 23, 2015 by Russ.